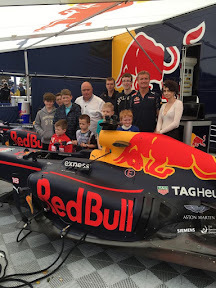 David Coulthard took time out of the fast lane to meet some of Scotland's bravest sick kids and give them a shot of his F1 car. 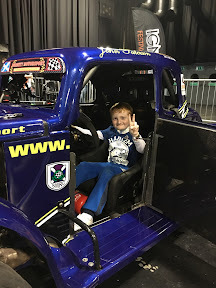 The racing champ, who has been appearing at the Ignition Festival at Glasgow's SSE Hydro complex took the special pit stop to meet kids from the Les Hoey MBE Dreammaker Foundation today. Amongst the kids who got a chance to speak with the star were little Arran Paterson, 8, who desperately needs a liver transplant. Arran's dad Derek from Baillieston said: "Arran has had twenty five procedures and it really brightened him up to meet David today. It gives him a wee boost. He has an underlying heart condition and needs a liver transplant and we got the call last week but the match was not suitable for his age and size." Ben Baikie, 6 from Lenzie has leukaemia and loves racing cars. Dad John said: "He loves Ferraris big and was so excited to be up so close. 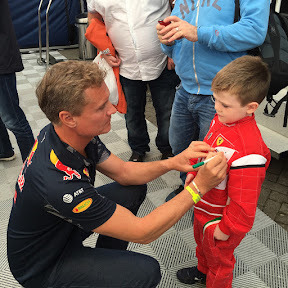 Ben had his Ferrari outfit on and David gave him a wee hug too. It takes his mind off things and gives him good memories and happy times." Grangemouth lad David Carr, 7, who was with his mum Laura also loved the cars. Laura said: "Carr by name, Car by nature. David likes any type of car from American muscle to Formula One. He can tell you a car just by looking at its front lights." David was diagnosed with a brain tumour in August 2014 and often gets tired. 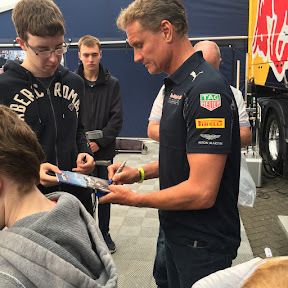 He was thrilled when David Coulthard asked him about his condition and what his tube was for. He went very quiet because he was in awe." Charity man Les Hoey said: "We were thrilled David gave us his precious time today. It really helps the kids to have such a great day out."